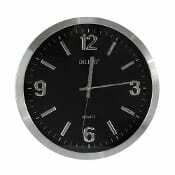 WALL CLOCK HIDDEN CAMERA – This new designer clock is a completely self contained hidden camera, it has a built-in motion activated DVR, 1/3” SONY CCD camera image sensor for clear video. Best of all it also supports up to a 32 GB SD card allowing for days of recording. Combine this with its motion activation feature and you’re sure to only capture actual events, eliminating the possibility of sifting through hours of empty room footage.